Abstract : In this paper, we address the problem of temporal alignment of surfaces for subjects dressed in wide clothing, as acquired by calibrated multi-camera systems. Most existing methods solve the alignment by fitting a single surface template to each instant's 3D observations, relying on a dense point-to-point correspondence scheme, e.g. by matching individual surface points based on local geometric features or proximity. 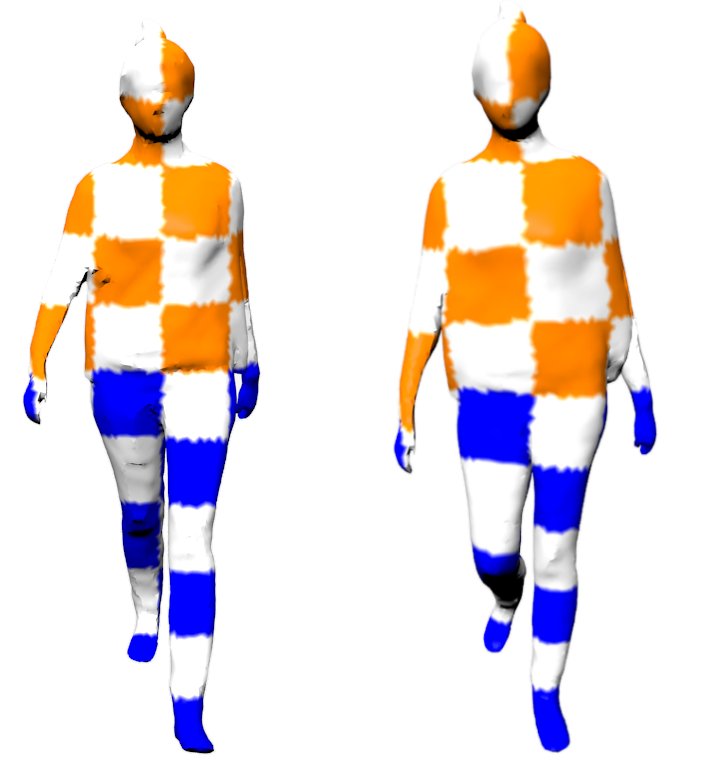 The wide clothing situation yields more geometric and topological difficulties in observed sequences, such as apparent merging of surface components, misreconstructions, and partial surface observation, resulting in overly sparse, erroneous point-to-point correspondences, and thus alignment failures. To resolve these issues, we propose an alignment framework where point-to-point correspondences are obtained by growing isometric patches from a set of reliably obtained body landmarks. This correspondence decreases the reliance on local geometric features subject to instability, instead emphasizing the surface neighborhood coherence of matches, while improving density given sufficient landmark coverage. We validate and verify the resulting improved alignment performance in our experiments.